The Olympus Penpal PP-1 is a Bluetooth device that lets you send and receive JPEG photos, one at a time, between a compatible Olympus Pen Micro Four Thirds compact system camera and another Bluetooth-equipped device, like a smartphone, tablet device, or even a PC. 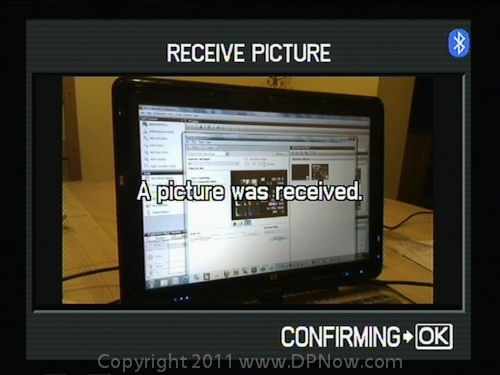 You can even exchange photos with another PP-1 equipped camera. The PP-1 device also has its own storage memory and it can contain up to 2,600 or so images, although these may be reduced in size when copied to the PP-1. 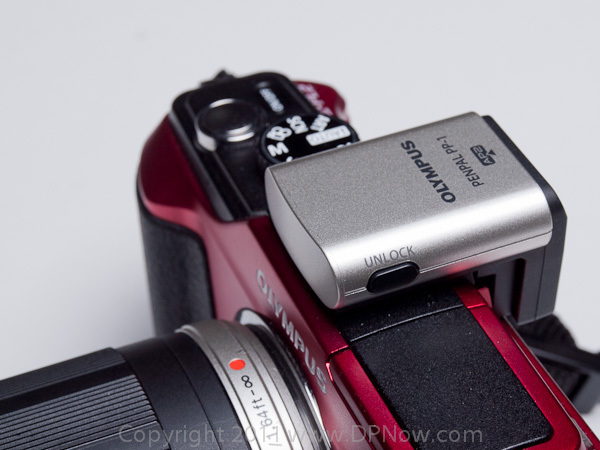 The Penpal PP-1 fits neatly to the Accessory Port 2 slotted into the flash hot shoe. 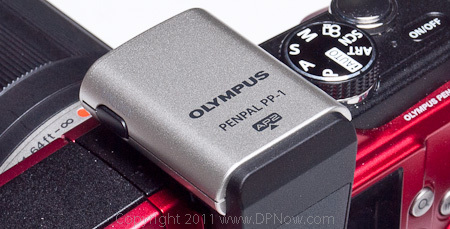 At the time of writing the only Olympus Pen that's compatible with the Penpal interface is the E-PL2. Apple iPod and iPad fans will be disappointed to read that the system is not compatible with their gear because the OBEX file sharing protocol is not supported by Apple. Olympus Europe has a downloadable compatibility list which reveals that many Android 1.6 phones and later, LG proprietary phones, Nokia, and RIM Blackberry phones will work with the PP-1. Confusingly, there are some Android phones, including the latest Android 2.3 Google Nexus S, which won't work with the PP-1, along with selected Blackberry models and Samsungs. For the technically minded, you need to check that your device supports the OOP or BIP protocols. 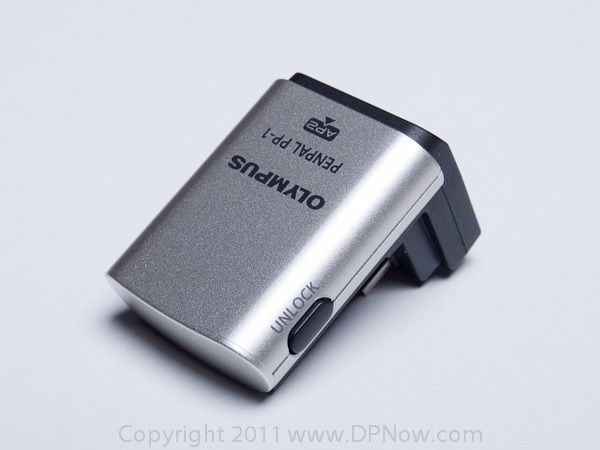 The PP-1 is an Olympus Accessory Port 2 device. 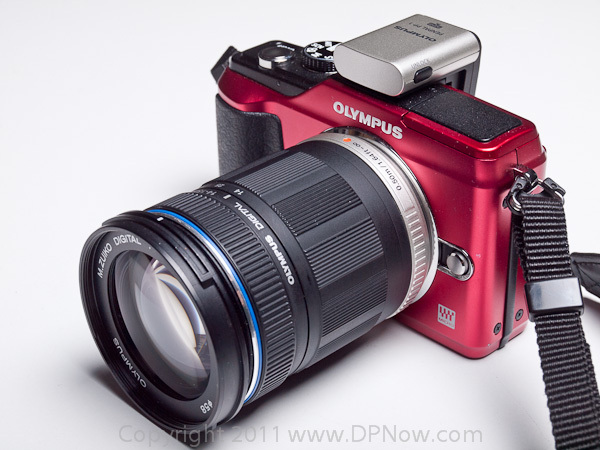 Accessory Port 1, which works with the VF-2 clip-on electronic viewfinder and SEMA-1 stereo microphone adapter, has been featured on Olympus Pens since the E-P2, including the E-PL1 and XZ-1 compact camera. 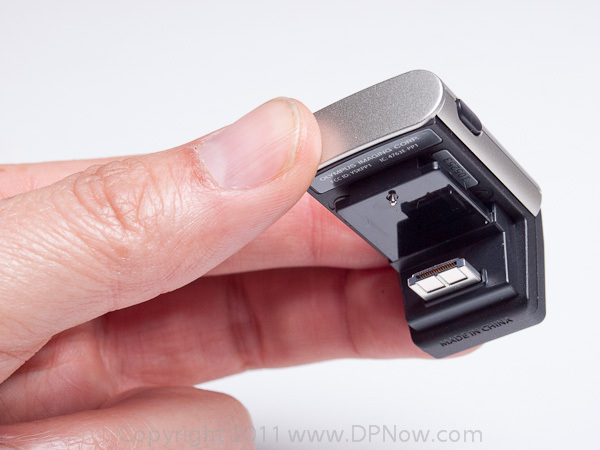 Although the Accessory Port 2 is externally identical and backwards compatible with AP1, Penpal devices require Accessory Port 2. You can't use Penpal devices, like the PP-1, on camera models earlier than the E-PL2. Like all Accessory Port devices, you have to consider that when they are in use the hot shoe can't be used for its traditional function with an attached flash unit. 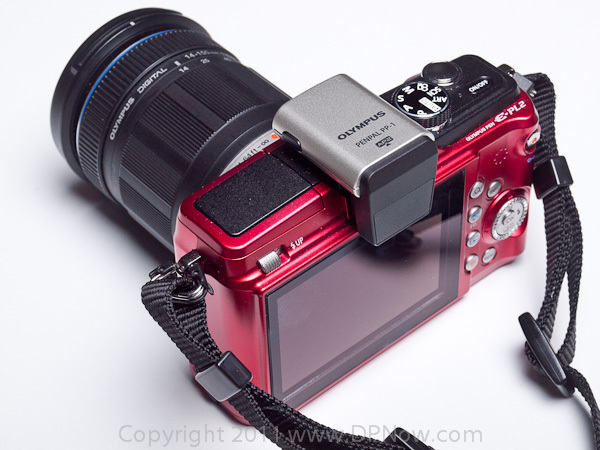 Thankfully, Olympus has provided a locking clip that keeps the PP-1 securely attached to the hot shoe. To remove the PP-1 you just squeeze the release switch and pull gently backwards. There are no batteries or leads, just a slip-on cover to protect the Accessory Port 2 connector. The PP-1 is compact and hardly weighs anything and is firmly in keeping with the small and light attributes of the Olympus Pen camera range. As previously mentioned, the PP-1 is not just a Bluetooth networking radio, it's also a storage device. If you copy a JPEG image to the PP-1 it will be re-sized to 1920x1440 pixels. You can't store or send RAW files, or video clips. RAW files can be converted to a JPEG using the camera's editing tools, if required, enabling a photo shot only in RAW to be sent or stored in the PP-1. As with any Bluetooth device, you first need to pair your camera and PP-1 with another compatible Bluetooth device. I successfully paired up a Nokia N97 Mini smartphone, a HTC Desire Android smartphone, and a Windows 7 laptop. You can pair the PP-1 with several devices and it will remember the pairing details in its Address Book. The default name for the Penpal is 'Olympus Penpal', but this can be customised using a name editor in the camera..
Once a pairing has been successfully established, you can either send a picture from the camera to the other device, or vice-versa. Only one image can be sent at a time and only JPEG images are supported. You can use the PP-1 simply as the Bluetooth interface and transmit a full-size JPEG from the camera to the other device, or you can send reduced-size versions of your images previously transferred from the camera's SD card to the PP-1's internal memory. Like a memory card or USB stick, you can erase of format the PP-1's internal memory and the contents are preserved even when not attached to the camera. Although you can only send or receive on image at a time, you can copy (and resize) all the JPEG images on the camera's SD card to the PP-1 memory in one action. You can also copy the entire contents of the PP-1 to the SD Card. The files are renumbered so neither action will over-write precious originals, but it does mean that if you add new photos and want to mass copy them to the PP-1 or vice-versa, you could end up with masses of duplicate images all with different file names. Sending a photo is actually very easy once you know how. But Olympus have not made it very easy to discover how it's done. The PP-1 comes in a small plastic box with a multi-lingual sheet that simply shows you how to attach the device to the camera and provides some notes on what not to do. But it doesn't say anything about how to use the PP-1. I can imagine lots of new PP-1 users who haven't read articles like this one, or the camera manual, tearing their hair out as a result. The instructions are actually in the camera's user guide, but as we all know, who reads those?! The simplicity of it all is that you simply go into playback mode and when you see a photo you would like to transmit, press the camera's OK button and then scroll down the menu until you get to the SEND option. You are then asked to confirm which destination device you want to send to, and off you go. Oddly enough, Olympus says that the receive functionality is not officially supported, but it does work. To receive a picture you need to go to the Accessory Port menu sub-menu A and use the amusingly labeled option 'Please Wait'. 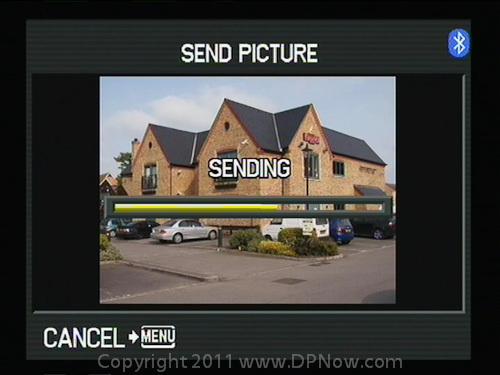 This provides access to a connection management option, and after pressing OK the camera waits for an incoming picture transfer request. On the other device use its photo sharing option to send to a Bluetooth device, select the PP-1 equipped camera and you're away. Sending from an Android phone did occasionally result in receive failures, and I suspect that this was because files were over an unknown size limit, somewhere around 1MB. Because this functionality is not officially supported, Olympus didn't have an answer as to why some images were not received successfully. Also, there is no option to fully trust the other device, so you need to authorise each and every image being received by pressing the OK button. To send photos in the PP-1 memory, press the Play button to get into the SD card viewing mode, and then press the play button again to get into the PP-1 picture store. After that, it's the same as sending from the SD card. When sending from the PP-1 store there are three size versions of the photos that can be sent: Size 1 (Small) VGA or 640x480, Size 3 (Medium) or 1280x960, and Size 2 (Large) which is the original 1920x1440 size. I have no idea why 1 is small, 2, is large, and 3 is medium, but it is. 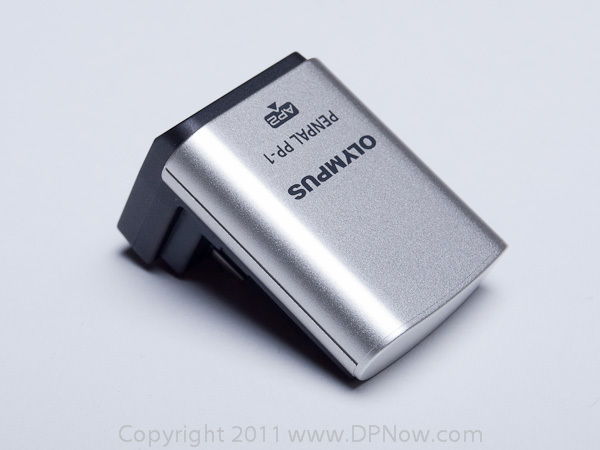 The Olympus Penpal PP-1 hardware is small, very neat and works well. But the job it does is very simple and it will be a completely personal decision concerning whether the asking price is worthwhile. It's a shame that there is limited compatibility, especially with Apple iPhone/iPod/iPad devices, and that you can't exchange video clips as well. Being able to select a batch of photos and send in one go would also have been handy. But for what it does, it does quite well and is an imaginative move on the part of Olympus to enhance the attraction of its Pen compact system Micro Four Thirds cameras. On Page 2 of this article we look at the way the PP-1 works via illustrations of the PP-1's user interface in action.